A Washington Army National Guard medic from Kettle Falls has been awarded one of the nation’s highest military honors for braving enemy fire to treat Iraqi national guard soldiers during an attack on a military convoy near Fallujah in November. Spc. 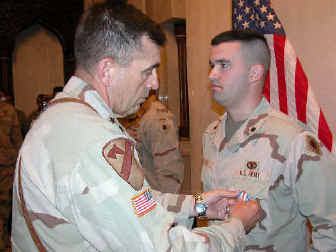 Gerrit Kobes, credited with saving the lives of Iraqi soldiers, was presented the Silver Star medal last week by Maj. Gen. Peter Chiarelli, commander of the 1st Cavalry Division. “Sir, you are a tremendous individual and a great hero, and I’m honored to be in your presence,” Chiarelli told Kobes during the presentation ceremony Wednesday at Forward Operating Base Honor in Baghdad. Kobes, 23, who works for a wood-stove company in Colville, accepted the combat medal with humility. Washington National Guard spokesman Col. Rick Patterson said Monday that to the best of his knowledge, this is the first Silver Star awarded to a Washington guardsman since the 81st Brigade Combat team was deployed to Iraq in April. Though Kobes is a member of the brigade’s Headquarters Company, 1st Battalion of the 161st Infantry Regiment, many of whom are from the Spokane area, he has been temporarily assigned to a California Army National Guard unit now helping the 1st Cavalry’s Task Force Steel Dragon in Baghdad. On Nov. 2, 2004, Kobes was a medical specialist for two platoons of B Company, 1st Battalion, 160th Infantry Regiment, assigned to ferry Iraqi soldiers and equipment to Fallujah for the upcoming campaign. On the first day out, the convoy was hit with a roadside bomb and small-arms fire, the Army said. No one was injured. “We get a lot of contact, and we usually just push through,” Kobes said Monday in a telephone interview from Baghdad. After regrouping in the Abu Ghraib province west of Baghdad, the convoy of 60 U.S. and Iraqi vehicles moved out for Fallujah. Kobes’ truck was in the middle. A rocket-propelled grenade struck one of the lead trucks carrying Iraqi National Guard members, disabling the vehicle. The enemy began firing on the halted convoy with two heavy machine guns, RPGs and small arms. Kobes’ truck could not get around the Iraqis who were climbing out of their vehicles, taking cover and firing in all directions. Unable to drive to the wounded, Kobes grabbed his aid bag and ran 500 meters “through a storm of enemy fire” with his platoon sergeant, John Todd, to get to the injured Iraqi soldiers, according to an Army account of the incident. When Kobes and Todd reached the injured, they found U.S. Marines trying to secure the site. Four wounded Iraqis were lying on the ground. Kobes performed a quick triage. “One guy had a lot of blood loss. I treated him and put a tourniquet on,” he said. With Bravo Company laying down suppressing fire, Kobes treated another Iraqi for a head wound and a hole through his hand. Another’s leg was bleeding and a fourth had taken shrapnel in his face. As the convoy started to move, Kobes again exposed himself to enemy fire as he loaded the wounded in the passing vehicles. No one driver wanted to stop long enough to board all four of the wounded. Kobes assessed the injuries to a fifth Iraqi who had taken the brunt of the RPG that stopped the convoy. The medic determined that it was too late to save the guardsman and called off medical evacuation by helicopter. Kobes and Todd returned to their truck. The Iraqi wounded were taken to an aid station in Fallujah, and Kobes never saw them again. Back in Northport, Wash., Kobes’ wife, Erica, and their two sons, Tyson, 3, and P.J., 10 months, are staying with her mother while Kobes is away. She never heard the details of her husband’s heroism, however, until she read a letter from Kobes’ sergeant recommending the medic for a Bronze Star. In civilian life, Kobes, a 2000 graduate of Kettle Falls High School, works for Hearth and Home Technologies in Colville. The couple married just before he left for Fort Lewis in November 2003. He has been in the National Guard since 2002. According to Patterson, members of the 81st Brigade have already started coming home. Many of the 161st are expected back sometime in March. When Kobes returns, he can expect quite a reception at the Kettle Falls American Legion Hall, his wife said. The November attack on the road to Fallujah was not the first time Kobes distinguished himself in combat. Kobes was able to save the Bravo Company soldier by placing a tube down the wounded man’s trachea, allowing him to breathe. “That was pretty rewarding knowing I helped,” Kobes said. For his effort, Kobes was presented with an Army Commendation medal with valor.